Blanch vegetabkes or cook a pot of fluffy white rice on this everyday pan. This pan is perfect for a family sized batch of oatmeal or a side of healthy steamed broccoli. There's a reason why Anolon is the Gourmet Authority - we take the time to make quality, precision cookware that creates the perfect balance between functional beauty and the durability you need for everyday cooking. Twice as hard as stainless steel and metal utensil safe, the hard-anodised construction of this Anolon Endurance+ saucepan provides exceptional heat conductivity and distribution. DuPont Autograph® non-stick provides maximum food release and is easy to clean. Riveted handles for strength and durability, with SureGrip™ for ultimate comfort. A high quality, mid sized saucepan, ideal for cooking family sized side dishes, or other elements of a main meal. 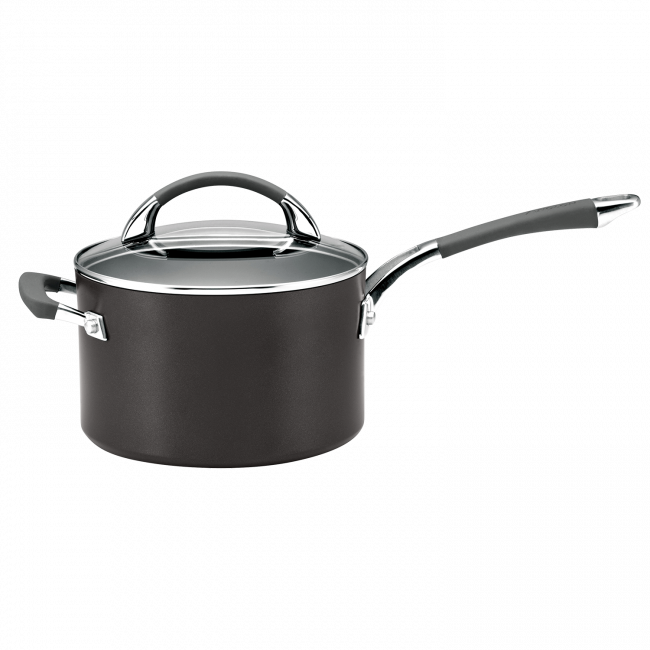 Anolon Endurance+ 20cm/3.8L Saucepan is rated 5.0 out of 5 by 1. Rated 5 out of 5 by DeeJ from Love this product. I have the 6 piece set and then went on to buy the larger saucepan and the 7 litre casserole pot because I love, love, love them. I love that the handles don’t get hot, I love that you can see through the lids, they are the perfect sizes, you can use metal utensils on them without causing any damage, but most of all I love that they really are non stick, which makes them so easy to clean. By far the best pots I’ve ever bought.